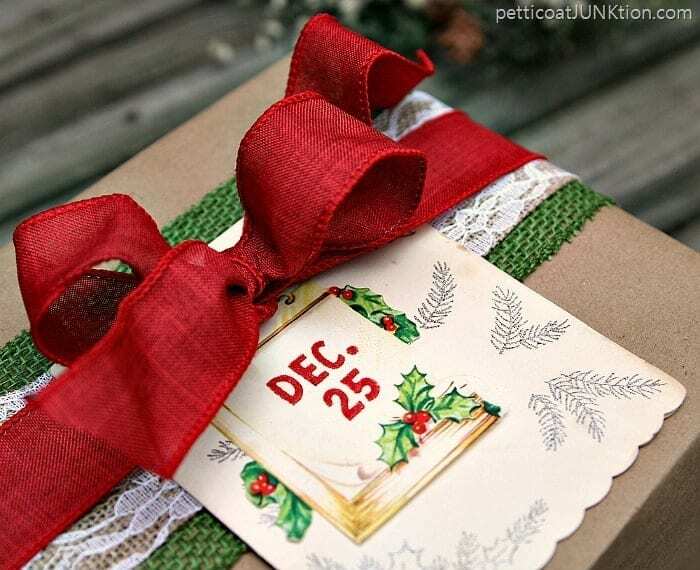 Welcome to the second day of the Gift Wrap Ideas Tour! I love wrapping gifts. How about you guys? It seems every year my gift wrapping style goes in a new direction. This year I decided to wrap all my gifts in Kraft paper instead of brightly colored or patterned gift wrap. I know, surprise. 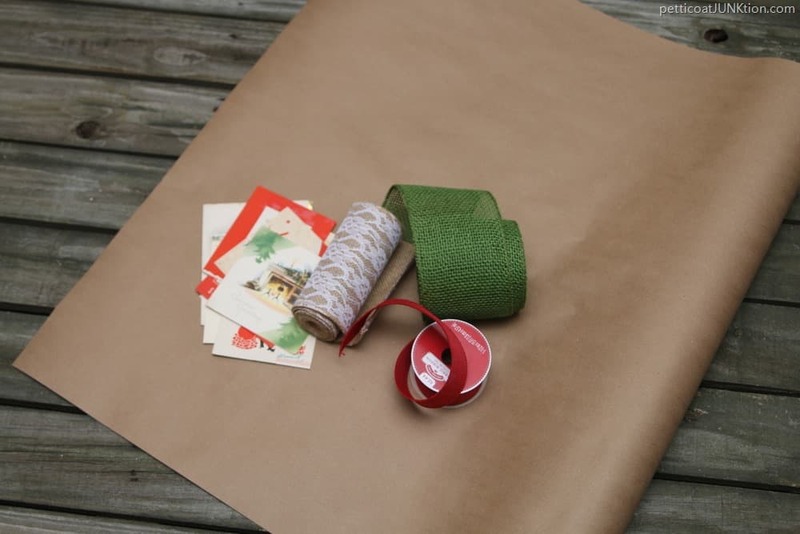 I love bright colors but I also like to use brown paper for wrap because there are so many ways to dress it up. I started out with the green and red ribbon but didn’t like the large width difference between the two. I found the lace and burlap ribbon in my stash, cut the width down, and added it as a layer between the green and red. 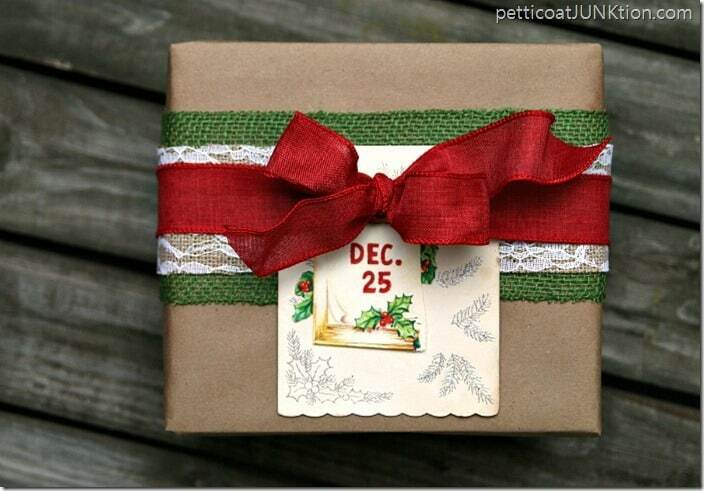 The three layers of ribbon look awesome! Patting myself on the back. For the Handmade ornament blog hop in October I used a few vintage Christmas cards to make cute Christmas tree ornaments. I loved the look of the vintage cards and found some on Ebay to order since my supply was running low. I choose one to dress up this package and use for a gift tag. The colors and design of the card work perfectly. 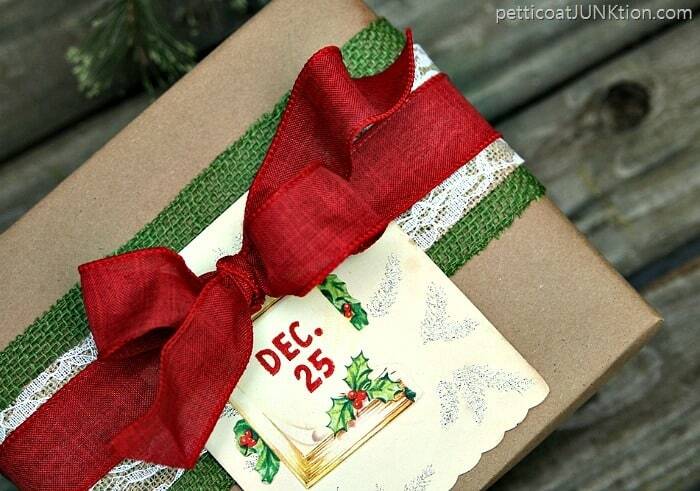 What gift wrapping tips do you have? Does your style change every year like mine does? Leave me a comment and take the tour. Just click the” pink links”! Want more Petticoat Junktion Christmas Inspiration? Click any photo below! Kathy – you are a girl after our own hearts! We absolutely love your vintage gift wrap. As collectors of vintage Christmas cards and postcards it doesn’t get any better than this! Very pretty Kathy – who wouldn’t want a gift so beautifully wrapped. I don’t use wrapping paper either. Instead, I use white kraft paper with pretty fabric bows and a little Christmas Ornament hanging from a bow. I often get teased for my “Martha Stewart” gifts but I don’t care, it’s fun wrapping them. 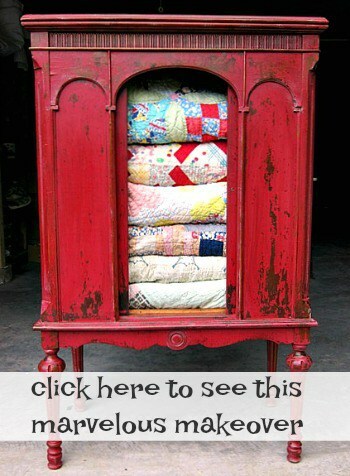 This is such a pretty way to re-use those old car you find in thrift stores. I LOVE it! So beautiful and easy to y!!! Thanks Kathy! I love this look! It’s so charming and simple yet still festive. Kathy – This is gorgeous! 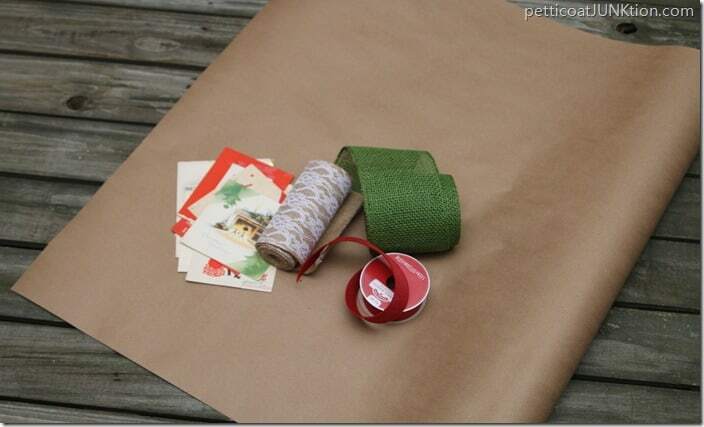 I just told my husband last week that I wanted to do kraft paper wrapping this year so I can decorate them myself with different types of ribbon and handmade tags. This gave me an idea infusion! 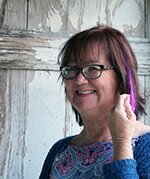 Kathy, I love how you layered the 3 ribbons, and I have some of that same lace patterned burlap ribbon in my stash, too. The vintage card is a great touch, too, which reminds me that I have some vintage Mickey Mouse Christmas cards, too. Pinning and sharing your beautiful ideas! Love the vintage look! My mother in law always saved the Sunday comics to wrap the grandkids gifts in. I always use a different wrapping paper for each person and don’t use tags so the they don’t know which gifts are theirs. Oh Kathy…I so love the VINTAGE TOUCH!!!! It is so very sweet and beautiful!!! Those that receive these beauties will have a big smile on their face for sure! You have worked your magic once again! I so love this idea Kathy!….Love the beautiful layering of the ribbon and now I am off to find some vintage Christmas/post cards…Great partying with you!!! I love this look Kathy. The vintage Christmas card is a wonderful way to finish it off!